WooCommerce is the most popular eCommerce platform on the web. With close to 16.5 million downloads, it is the platform of choice for 37% of all online stores. With WooCommerce you get a clutch of fundamental features that are critical for all online stores. But fundamental features may not be enough, if your store has some unique requirements. This depends on the type of product you sell. For instance, a store selling gift articles may require a gift wrap option. An educational institution may need options for online courses. As you can see, it is near impossible for any single plugin to cover all the features needed by each and every kind of store. This is where WooCommerce extensions and addons do a wonderful job. They can fulfill specific functions required by different kinds of stores. They add functionality to WooCommerce. There are a whole lot of plugins, extensions and addons that can be added to WooCommerce to enhance functionality. Each store can pick and choose according to their needs. These plugins can be downloaded /purchased both from WooCommerce and from third parties. A gift store can add on a plugin for preferred delivery times, while a bookings extension will make work easier for a hotel or fitness center. I have picked 7 plugins that can do a good job of sprucing up a majority of stores in general. WooWaitlist enables a store to notify a guest or a subscriber by email that a product is back in stock. 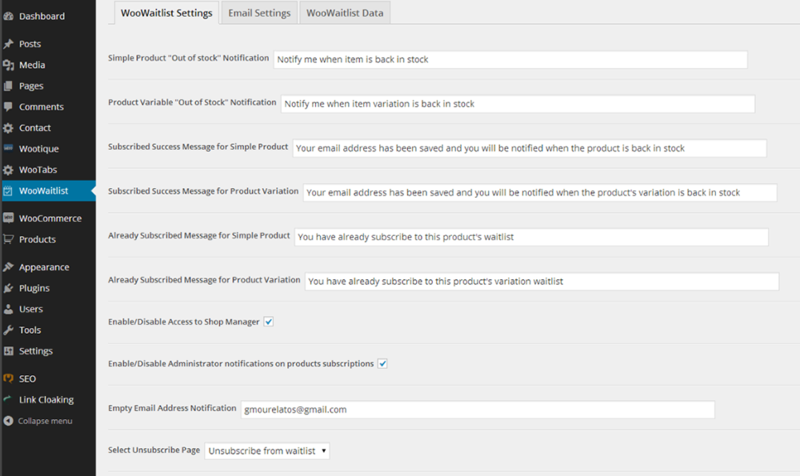 Using shortcode, the wait list can even be displayed on the profile page of the subscriber with a link to the product. This plugin makes sure that a store never loses sight of potential customers or their interest in a specific product. It makes it easy to remind customers that the product has become available and they simply have to click on the link to complete the purchase. One time visitors are converted into purchasers more easily. WooWaitlist integrates easily with WooCommerce, is translation ready and can export the wait list in CSV format to the store's purchase department. Not only that, if only one variation of a product is out of stock, the notification can be sent out for that product variation alone. WooWaitlist helps in capturing leads and can keep tabs on which product is in demand. Once a visitor is interested in a product, he is likely to have questions about it. Product Enquiry for WooCommerce adds a button to every product page that enables a visitor to raise any query about the product. Without leaving the product page, the potential buyer can request a quote or ask any question. This increases the chances of conversion. The text in the button can be customized and localized. When the button is clicked, an email is sent to the store owner or plugin user. The premium version of the plugin allows the button to be styled, supports product variations, supports multiple product enquiries on a single page, auto-generates a quote in PDF and much more. Product enquiry promotes interaction between a potential customer and the store owner, giving the store owner an opportunity to convert an unsure customer into a buyer. To have great deal of flexibility in pricing products in your store, check out WooCommerce Dynamic Pricing & Discounts. You can introduce pricing options based on conditional logic and apply it store wide in an instant. Flash sales, seasonal sales, discounts based on product bundling or volumes, cart discounts, flash sales, clearance sales - can all be set up in a matter of minutes. The rule editor will help you create any number of pricing rules. Rules can be applied selectively to products and categories. They can also be applied all at once or sequentially in a predetermined order. WooCommerce Dynamic Pricing & Discounts can help you implement your marketing strategies and offer the right deal to the customer. You can offer and keep track of loyalty discounts, offer discounts to consumer clubs or to individual retailers, and design your store to function both as a retail and as a wholesale center. WooCommerce Advanced Shipping applies conditional logic to offer a number of options for shipping the product. Country, zip code, subtotals, quantity, weight or size specifications - can all be used as conditions to arrive at various shipping options. Using extensions, you can also create shipping zones on the basis of geographical areas. Or you can choose advanced pricing to treat one group of countries (like the European Union) identically. Prices can be per product, per category or per shipping class. You can also arrive at your own table by working out and applying different shipping rates with suitable conditions. WooCommerce EU VAT Compliance is quite indispensable for any store selling to a country located in the European Union. This tax is imposed in the country of purchase and is applicable even if the seller is not located in the EU. This plugin identifies the location of the purchaser and applies the correct VAT rate. Prices can be displayed inclusive of VAT and in different currencies. The tax collected is shown separately in the PDF invoice. The VAT numbers can be validated for B2B transactions and all data required for generating returns and sortable reports are stored and accessible. If your store finds it burdensome to comply with VAT, you can also forbid transactions for which VAT is applicable. This plugin minimizes the pain of complying with VAT regulations. To reach customers the world over, you have to talk to customers in their own language. 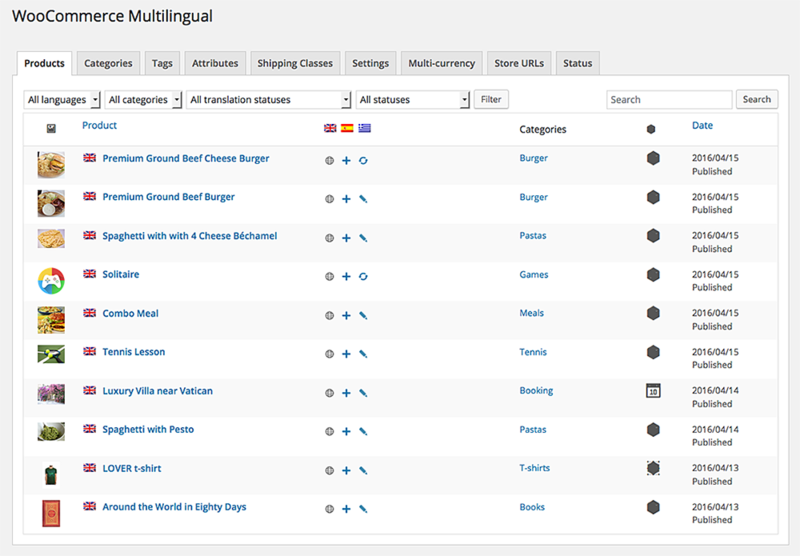 WooCommerce Multilingual bridges 2 plugins - WooCommerce and WordPress Multilingual. This plugin makes it possible for viewers to access your store, all the way from product categories to checkout, in their preferred language. Products and store pages can be translated, and users can switch between languages. RTL support is available, as well as support for payment in multiple currencies. The plugin provides a convenient interface for translation of products and support for product variations. Site owners will be notified if any product page remains untranslated. With this plugin, it is possible to send out email notifications to customers in their selected language. It can help to run a multiple language eCommerce store smoothly. No store can offer products on a one-size-fits-all basis. Each visitor is unique and needs products suited to his individual requirement. 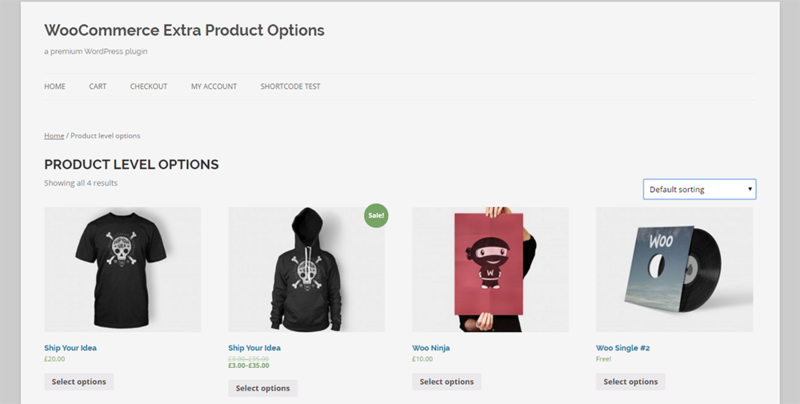 WooCommerce Extra Product Options allows a store to offer extra product options for each product. Global pricing options can be added to hundreds of products in just a few minutes. With the help of check boxes, radio buttons, range picker or color picker, a number of product options can be displayed along with the price tagged to each variation. Conditional logic is enabled and you can opt to hide the prices. Display can be normal or mounted on a slider or can be made to pop out on the screen. In fact, you can have complete control over the fields created and you can place them anywhere. This versatile plugin makes it easy for stores to easily customize product pages and create a convenient shopping experience for customers. The number of extensions and addons for WooCommerce is truly large. Keeping efficient backend operations and frontend user experience as the reference point, pick and choose only those that can add value to your store and improve its ability to a sell a product or a catalog of products.